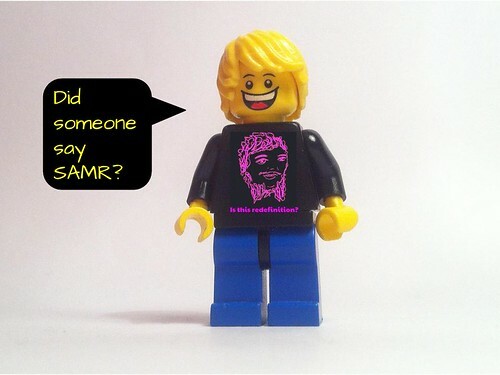 Did someone say … SAMR? 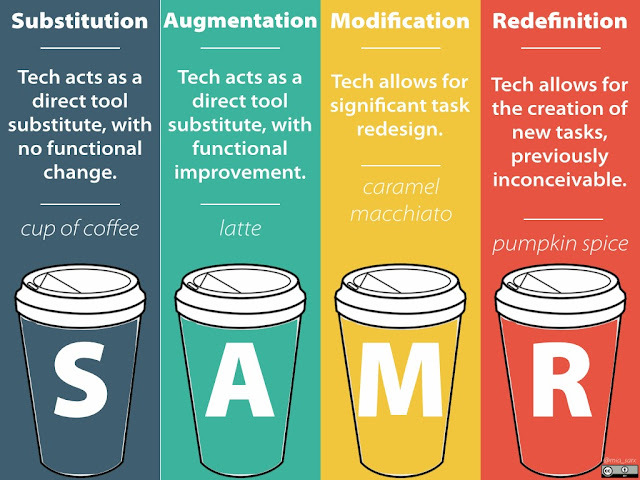 SAMR is an acronym standing for substitution, augmentation, modification and redefinition. It is a model for looking at the integration of technology into education. It is often used to support staff with how to make better use of technology within the classroom. Devised by Ruben R. Puentedura, the premise behind it is that each layer provides a deeper level of engagement and involvement with technology. Starting with a mirroring of what is happening outside of technology, it then progresses to opportunities that are afforded only through the use of technology. Susan Oxnevad has created a wonderful interaction visual guide using Thinglink. Not only does it provide further clarification, but also a range of examples focusing on the skills of research, writing and digital citizenship. While in an attempt to make sense of the model in his own way, Jonathon Brubaker uses the analogy of ordering a coffee from a cafe to explain the different layers. What is significant about Wells’ revision is the focus on teacher/learner mindset, as much as the task at hand. He also provides some good questions to how guide reflection on technology. Continuing on a similar vein, Jackie Gerstein reframes SAMR in regards to the move from pedagogy to heutagogy. She marries the different layers with her case for Education 1.0, Education 2.0 and Education 3.0. Using rhythmical rhyme, she creates what Oliver Sacks calls an ‘earworm’. In regards to examples, Anthony Speranza wrote a post exploring the different uses of Google Apps for Education. In it he unpacks the possibilities of applications like Google Sites and Blogger using SAMR as a guide. He explains how applications can be used as a means for everything from recording personal writing to transforming the classroom by connecting and collaborating with other students from around the world. Considering SAMR from the perspective of iPads in a secondary environment, Richard Wells provides some examples of ways in which technology use changes at the different levels, from simply using it to generate digital tests to making a series of videos on a topic. OBSTRUCTION: Alice Keeler talks about the dangers of pushing technology for the sack of it, where instead of redefining learning, it becomes a frustrating obstruction. In addition to this, the focus becomes what rather than why. Ewan McIntosh touches on this, in his book How To Come Up with Great Ideas, when he gives the scenario of investing in old technology to fill the desire for a one-to-one laptop program. In the long run, such a ‘grey compromise’ can actually set back similar innovations. TASK NOT TEACHER: Catlin Tucker suggests that a focus on tasks overlooks the holistic nature of technology integration. Tucker proposes her own model focusing on teacher development. Starting with getting connected, then incorporating technology within instruction, after that using it to engage students in learning. The final challenge is to skilfully use technology inside and outside of the classroom to enable learning. Mark Samberg continues in much the same vein pointing out that there is little detail of instruction, instead technology is described as the transformational solution. CONTEXT: Mark Anderson explains that SAMR is not a ladder. Being so makes it an exclusive club that is measured by those best apt at utilising different programs and applications. Instead, technology integration needs to be seen as a part of a wider context. Talking about the same concerns in regards to context, Steve Wheeler argues that the opportunities afforded by technology are often missed when we do not situation learning in real situations. While Alan November contends that even though the learning may be deemed as redefined, it really needs to be transformational. TOO SIMPLE: Darren Draper questions whether the integration of technology is ever obvious. In addition to this, he wonders what the supposed benefits to be gained are? More fun? Improved engagement? Better test scores? According to Draper, teaching at a ‘higher’ level does not guarantee better, merely different. AMBIGUOUS: Chris Hesselbein discusses the confusion associated with augmentation and modification. His solution is a mash-up of Marzano’s four point rubric with Joan Hughes’ RAT Framework. Focusing on only three steps – replacement, amplification and transformation – Hesselbein adds leadership into the mix to achieve Marzano’s four points. The suggestion is that surpassing the transformation phase involves working collaboratively to share and support other teachers on their journey. TRIVIAL: Jonas Linderoth suggests that the ideas put forward through the SAMR model are not only obvious, but nothing new. This is something echoed by Gary Stager in a recent present where he remarked that there has been nothing new in regards to the implementation of technology for the last 30 years. Stager makes the comment that we would do well to go and reread Papert’s 20 Things to Do With a Computer. In addition to this, Puentedura’s work is based on unsubstantiated research and a doctorate in a completely different field of study (Chemistry). FUNCTION NOT FORM: LeiLani Cauthen argues that the model actually stifles any discussion about new models of school and changing the traditional paradigm. According the Cauthen, we need to redefine function, not form. “Form follows function, and the current educational forms are not aligned to new function.” Coming at the problem from a different perspective of learning spaces, Matt Esterman suggests that instead of designing for the unknown, teachers more often simply want a shiny version of what they already have. Go ahead, tear down your SAMR god…whatever you put in its place will serve for a time then be smashed to the ground. Not because the gods are unworthy, but because you invested them with so much of your understanding that when you grew, you failed to see how the model serves as a springboard for thinking, not a locked room that keeps fresh ideas out. 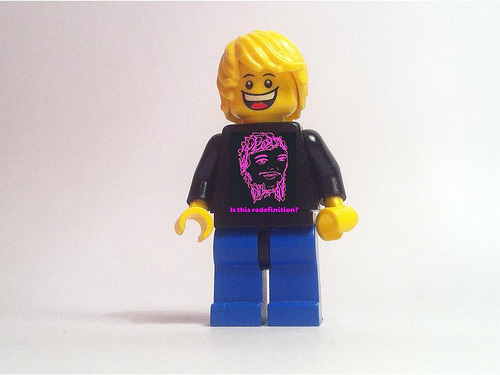 So what are you doing to drive change? How are you thinking? Is there something that you think I may have missed? As always, comments are welcome. 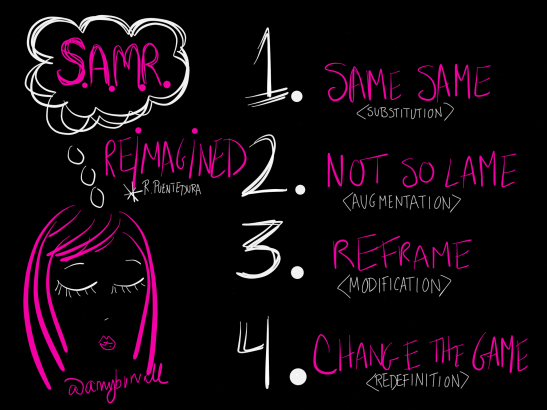 Did someone say … SAMR? by Aaron Davis is licensed under a Creative Commons Attribution-ShareAlike 4.0 International License. Wow, what a great post! Love the roundup of ideas and tools. The reality is, nothing will ever be good enough. If it’s too good, we can’t achieve it. If it’s not good enough, it’s unworthy of our practice. The truth is, we just have to push through and use technology to enhance teaching and learning. Thank you Miguel for your response. I think you have hit the nail on the head. I feel that we need to start with teaching and learning, the ‘why’ of what we do, and go from there. A big post Aaron .. . I am an evidence kind of person … you have to have done the research to make the claim me thinks. My issue is … who is defining SAMR at the upper levels – what you say/see is Modification maybe totally different to what I say/see as Modification. There is no research to make the claims that this is what happens in classrooms. It was an educated guess at the time that came out very quickly after Mishra & Koehler’s seminal work in TPACK (2006). At the lower levels maybe … yes that is Substitution … that is Augmentation – I can see why teachers like it – I am on Stager’s side I’m afraid – it does not take us forward – there is nothing new here. Thank you Jane for the comment. The more I dug through various posts on SAMR the more interesting it became. I did listen to your interview on the TER Podcast. Was intrigued with the idea of high functioning classrooms. Will have to read the book to get a better understanding I think. At the very least, it is a topic worth questioning. Great smorgasbord of SAMR served up in a variety of ways! Thanks Anna, glad you found it useful.